Air pollution is a major contributor to ill health in the UK, but it's hard to say exactly by how much. Dirty air doesn't directly kill people. But it's estimated in the UK to contribute to the shortening of the lives of around 40,000 people a year, principally by undermining the health of people with heart or lung problems. How accurate are media headlines about 40,000 deaths? Headlines claiming that pollution kills 40,000 are just wrong - it's more subtle than that. It's also wrong to say pollution in the UK is rising. The 40,000 pollution-related deaths figure is not a count of actual deaths - it's a statistical construct, with a lot of uncertainty involved. Government advisers say the 40,000 number might be a sixth as big - or twice as big. Pollution clearly is a problem, though. And, remember, it doesn't just contribute to early deaths, it also compromises the health of people suffering from ailments like asthma and hay fever. In cities globally, pollution is increasing. In the UK, air pollution nationally has been generally dropping (except from ammonia from farming). But despite the overall fall, in many big UK cities safe limits on harmful particulates and oxides of nitrogen - NOx - are still regularly breached. And in London, NOx levels at the roadside have barely dropped at all. Why is there so much concern at the moment? 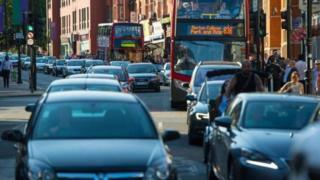 Experts in air pollution argue that it has been under-reported for decades, but the issue has been thrust into the news because the UK government lost court cases over illegally dirty air, and because car makers were found to be cheating tests on car emissions. Scientists are also more confident now about the ways that air pollution harms people. It has even recently been linked with dementia, although that link remains debatable. Diesel cars seem to be portrayed as the main villains. Is that fair? Yes and no. Diesel car manufacturers drew fire by cheating emissions tests. Diesels are much more polluting than petrol cars on a local scale, and the biggest proportion of pollution in UK cities does come from road transport in general. But if you look at Greater London (London stats are the most detailed) you see that private diesel cars contribute 11% of NOx - less than you might have thought. Lorries - with far fewer numbers on the roads - produce the same amount. Zoom into Central London, and just 5% of NOx comes from private diesel cars. That is dwarfed by 38% from gas for heating homes and offices. There are many other sources of pollution, including buses, taxis, industry and other machinery, such as on building sites. So it's a many-sided problem. Solving air pollution needs a many-sided approach. The best value for money comes from targeting the really big individual polluters - that's old buses and lorries in cities. Most big cities are already doing that, although critics say not fast enough. Insulating homes so they don't burn as much gas, would save pollution, cash and carbon emissions in the long term - but critics say the government appears to have no strategy for this. What about taxing diesel cars more? A previous government encouraged drivers to buy diesel vehicles because they produced fewer emissions of greenhouse gases. Incentives for diesel were removed in 1999. Petrol cars are now almost as efficient and are much less polluting locally, so scientists say it makes sense to tax diesel cars extra. Politicians are nervous upsetting drivers, and we shall have to wait to the Budget to see how they respond. Ministers are also under pressure to offer a £3,500 incentive for drivers to scrap old diesel cars, which would incentivise the purchase of new cleaner vehicles. The Green party says it would be perverse to reward car makers with increased sales when they caused the problem in the first place by failing on their promises to government to make diesel engines clean. What does pollution do to our bodies? What are your solutions for air pollution?